New Norfolk NEWS: Have you seen this car? POLICE are seeking witnesses to a series of dangerous driving manoeuvres involving the silver-grey Mitsubishi Magna sedan pictured opposite. Seen here entering Burnett St, New Norfolk, in the wrong lane of traffic, the car is believed to be displaying false registration plates. The front plate reads DS8320 while the rear plate is FD2554. DS8320 is the expired registration of a white 1987 Toyota Tarago van while FD2554 is the lapsed registration of a red 1995 Daewoo Cielo. Detectives believe the Magna has been involved in a number of alleged police evasions, dangerous driving and the theft of tools from a ute in West Hobart on Sunday morning. 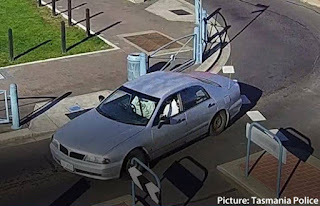 Police would like to hear from anyone who may have information that could assist with the investigation or that can identify the current owner or driver of the Mitsubishi Magna. Information can be relayed to Crime Stoppers by calling 1800 333 000 or online via www.crimestopperstas.com.au quoting reference number OR557950. Crime Stoppers does not need to know your name. Good to see the new security cameras working - they are going to be very useful!